Three villages get undrinkable water, unfit even for bathing. For a week, 5,000 men and women of all ages protested peacefully demanding the closure of a plant that dumps industrial waste into waterways. In trying to disperse protesters, soldiers and police ended up causing clashes. 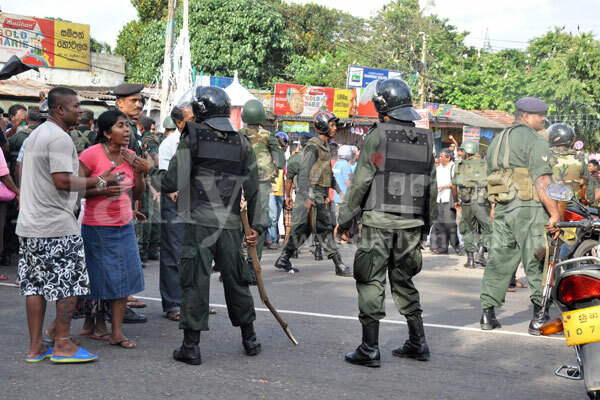 Colombo (AsiaNews) - Police and soldiers turned a peaceful protest into tragedy, leaving a youth dead and 15 people wounded after a week of protests against water contamination involving some 5,000 men, women, children and seniors in three villages in Gampaha District (Western Province). Residents in Weliveriya, Rathupaswela and Kirindiwela say that their water is not only unfit for drinking but that it is so filthy that it cannot be used even for bathing or washing. In fact, some who did have developed skin conditions. They blame a glove-making factory for contaminating local waterways. In the past seven days, thousands of them took to the streets, blocking roads to demand the authorities close the plant and study toxicity levels in the water. Unable to quell the demonstration, police yesterday called in the army. Once on the scene, soldiers expelled the media and told people to go home. After five minutes, they began throwing tear gas and turning water cannons on protesters, some of whom reacted by throwing stones and bottles filled with sand against soldiers and police. The latter fired back, killing a youth and injuring at least 15 other people. After the riots, plant owners agreed to close the facility for two weeks, pending tests to ascertain water quality. However, the company, Dipped Products, which makes gloves, said the plant had nothing to do with water pollution and would therefore be back in production soon. Contacted by AsiaNews, Hemntha Vithanage, executive director of the Centre for Environmental Justice/Friends of the Earth Sri Lanka, said that "although the plant will be closed to carry out necessary tests, people do not trust government agencies and fear that they will falsify the results. Water is a human right."